Every item of Kenner’s Star Wars packaging consists of a few basic elements: a film logo, the general cardback design for that series, any special offer and various trademark information and last but not least, a photograph or depiction of the toy as it appeared in the film. Grabbing a suitable screenshot or piece of artwork, jazzing it up in Photoshop and then dropping it into a cardback template sounds fairly simple. Unfortunately Kenner’s designers had to produce these cardbacks using far simpler means – below is a basic outline of the process they went through. 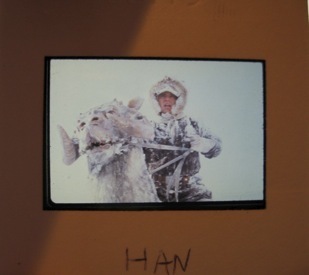 Firstly a 35mm slide for each character was selected from those provided by Lucasfilm.Often these photographs correspond to material used by other licensees, such as Topps. These images were then blown up to varying sizes, and the resultant photographs became the basis for cardback artwork. Once the photographs had been approved by Lucasfilm for use on the toy packaging, who kept a tight rein on all aspects of the merchandising of the films, including the toylines, the photgraphs were sent to outside design firms. These firms then mounted them on an heavy piece of cardboard, in preperation to rework them with an air bursh to either excentuate or remove detail. Aside from Anakin Skywalker, all of the original Star Wars to Power of the Force cardback images were created from original screen grabs from the Star Wars movies. These images may have been perfect for a half second on-screen appearance, but mostly they didn’t stand up to Kenner’s requirement for their cardback images. This meant that changes needed to be made by hand – a process that and turned these photographs into ‘photoart’. As already mentioned, Photoshop and computer imagery techniques were not available at this time. Airbrush artistry was used in place to make the cardback images suitable. The airbrushing process may be extensive or very subtle depending on what was required for each character. 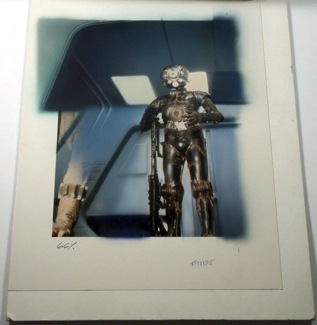 Often it involved anything from removing an unwanted element (for example R2-D2 was airbrushed out of the C-3PO cardback image), to totally re-constructing or highlighting elements of the image. Some cardbacks like Walrusman, Chewbacca or Bossk incorporated significant or total alteration of background images. 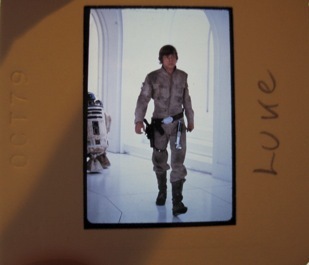 On rare occasions, photographs on cardbacks like Luke X-Wing or Luke Gunner were left largely untouched. Many images from the Power Of The Force series saw little to no alteration to the photographs chosen. In addition to airbrushing, some images were enhanced through the cutting and pasting ofphotographic elements. The photoart for the ESB Bespin scene Millenium Falcon for example, incorporates a pasted on cockpit. Sometimes, an acetate overlay was used, with photographic elements placed on the original image in a way that facilitated easy removal. The Zuckuss photoart to the right has been airbrushed to remove Bossk (see his leg remaining where the figure ‘bubble’ area would be on the final cardback). In addition, the ceiling of the Star Destroyer has been completely re-worked, as has the entire right hand side of the photograph. Below is a selection of Photoart from the Star Wars, Empire Strikes Back, Return of the Jedi and Power of the Force toylines. (Thanks to Tom Derby for permission to use these images, which were part of his inventory and sold through him).